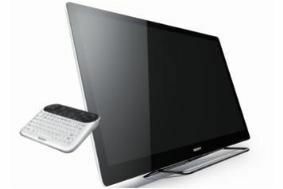 USA: Google-powered Sony internet TVs in shops this weekend | What Hi-Fi? All the products are powered by Intel's Atom processor, have built-in Wi-Fi, and will link to Android phones using a control app available later in the year. And in addition to their internet features they can also stream local content over the home network, being compliant with both UPnP and DLNA. They come with a range of applications preloaded, uncluding Sony's Qriocity on-demand service, Napster, Netflix, Pandora and YouTube, and will be able to download additional applications from the Android Market from next Spring. The Blu-ray player has both HDMI input and output, 8GB of internal storage, and four USB sockets – three on the rear, one on the front – so it can act as a hub for portable devices and storage. However, none of the new products are 3D-capable. No details have yet been announced concerning European availability or pricing, but you can see more pictures of the new range by clicking here.